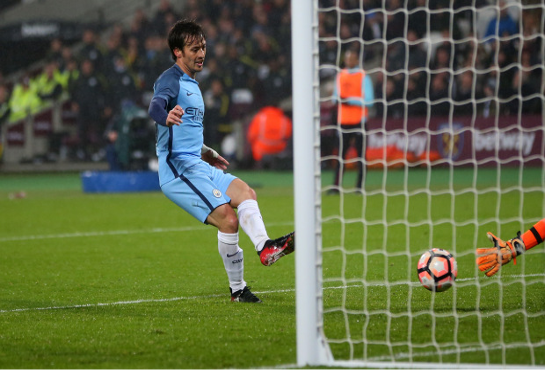 Manchester City strolled to a comfortable victory away to West Ham last evening as Pep Guardiola got off to a flying start in the FA Cup. The visitors raced into a 3-0 lead before half time at the London Stadium, with West Ham crumbling towards the end of the first period as City finally clicked into gear. Goals Yaya Toure, David Silva and Sergio Aguero and an own goal from Harvard Nordtveit secured City’s passage into the fourth round to ease the pressure on their manager. Guardiola did not seem in good spirits earlier in the week as his side ground out a 2-1 win over Burnley in the Premier League, but his side were on top form tonight. City started the stronger as Aguero forced a fine save from West Ham goalkeeper Adrian, but the floodgates finally opened just after the half-hour mark. Pablo Zabaleta broke forward for City before going down slightly easily after a challenge from Angelo Ogbonna, but Yaya Toure punished West Ham with a clinical finish from the penalty spot. Just eight minutes later it was 2-0, with City breaking superbly in a move involving Zabaleta, Aguero, Bacary Sagna, and finally Nordtveit, who bundled the ball past his own ‘keeper in an attempt to prevent Raheem Sterling providing the finish. The home side fell apart at this point and conceded the third just two minutes later, with Sterling’s low cross finding David Silva in acres of space to pass the ball in from close range. City played in second gear for much of the second half as West Ham rarely threatened any kind of a comeback, and further goals from Aguero and John Stones humiliated the Hammers in front of their own fans.